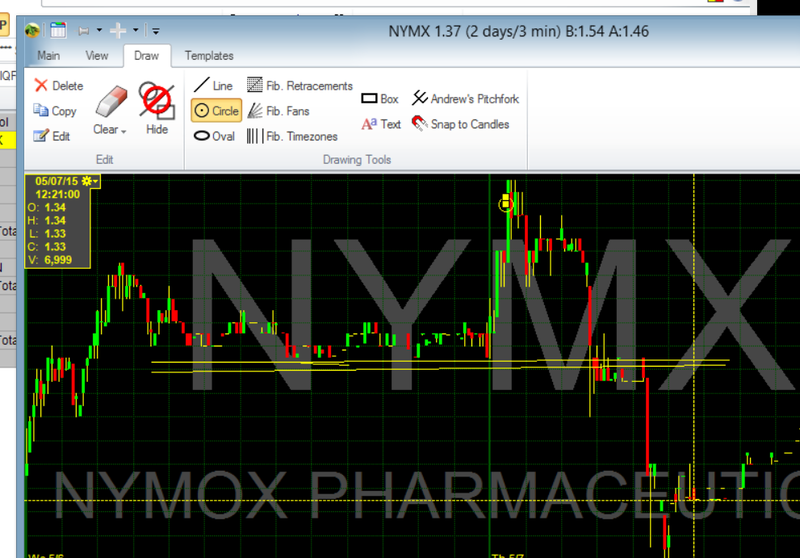 I longed NYMX with a buy stop that first day it started to run. I got a 1.38 entry. 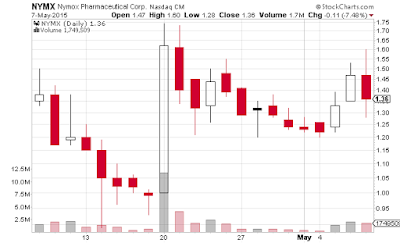 Today into the spike I sold just over half the position at 1.58 a share. That was a good exit because the highest the stock got was 1.60. I figured based on the past couple days of runs it would usually top out after 10% or so. I was really just looking at the candle lengths though. 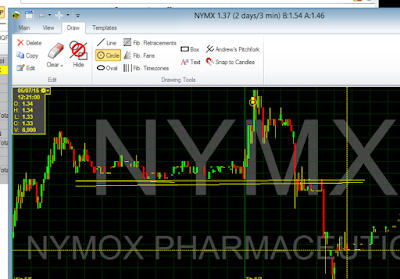 After selling those shares I immediately put a sell stop order to sell the rest if it hit 1.44. That would still lock in some profit but more importantly get me out of a free fall. Of course it could go the other way and just keep running to 2.00 a share or something. I always lock in atleast some profit in a profitable trade. I chose 1.44 as a good stop loss area because a technical breakdown would be taking place if it hit below 1.44. Once 1.44 was taken out everybody else's stop losses would trigger. As a result the fill I got wasn't that great. I got filled at 1.40. I would have scaled the same way if I had to do it again. Not selling the entire position at 1.58 cost me a little profit but it would have been way dumber to miss a 40% run or so which this stock has proven to be capable of. The only thing I did poorly on this trade was the entry. I could have gotten the 1.20s or low 1.30s. I probably should have scaled in with a small position first in the 1.20s because I was pretty confident on this run. In the chart below the yellow lines are under 1.44 that support I talked about.